Quebec City looks, at first glance, much like one of France's Atlantic coastal cities. A UNESCO-designated World Heritage site, Quebec City has gabled buildings dating from the 1600s and narrow, winding streets made of cobblestones. You can amble through airy plazas—past fountains and statues—as you make your way to Terrasse Dufferin, a wide promenade straddling the clifftop with fantastic views of the St. Lawrence River below. 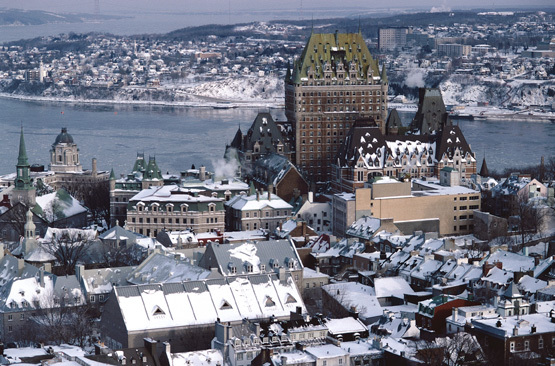 Presiding over it all is the Chateau Frontenac, a grand hotel reminiscent of a French castle. Stone fortifications, built by the French and improved upon by the British, circle the old center of Vieux Quebec and set it apart from any other city in Canada or the U.S. The walls divide Basse Ville (lower town) from Haute Ville (upper town), and are a testament to military conflicts involving the Iroquois, French, English and Americans. Beyond its deep history, Quebec City offers other enticements: The city's culture revolves around wining, dining and dancing (and more wining and dining). You will eat and drink well there. Cultural events by the likes of Cirque du Soleil, music festivals with free performances, and caleche horse-and-carriage rides take over the city in the warm-weather months. The capital of the province of Quebec, Quebec City has a bon-vivant temperament that sets it apart from Canada's English-speaking cities. Which leads us to the language question. Almost all Quebec City residents speak French as their primary tongue, but most who work in the tourist areas also speak some English—and they are friendly and helpful to visitors.